Something is happening in education at the moment which gives me concern. 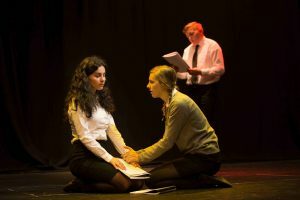 In order to fulfil the new requirements of the International Baccalaureate many senior schools are having to focus more on extending their ‘academic’ subject range at the expense of creative, expressive subjects like dance, music & drama. I recently met a teacher who, having worked in a large senior school for 15 years teaching GCSE and A-Level Drama, is losing her job in the summer as the school will no longer be offering these exams. Should we be concerned? Well, I definitely think we should. I’ll use my own education to illustrate why. At primary school I was fortunate to have the chance to take part in public performances and not just the traditional Christmas Nativity. We did ‘proper’ little plays and had an Irish dance team which competed in festivals and performed at Cadbury’s annual fete in Birmingham. I was also in the choir and learnt the piano. This helped me to develop from a slightly shy youngster (never! – did I hear you say?) to a more self-assured high school student. I was fortunate that at my high school and grammar school there were even more opportunities to perform. We did not have a ‘specialist’ drama teacher but did have English teachers who enjoyed theatre and knew how to bring words to life. No one wants to sit through a boring class reading Shakespeare. Of course, everyone hates it – it doesn’t make sense! But act it out with real feelings and a sense of relationships and it comes to life. Nowadays many English teachers do not have drama as a specialism and are not natural performers so how are they going to help the next generation to appreciate our great theatrical literary heritage? What will youngsters be losing if drama disappears from the state syllabus? →The opportunity to show emotion in a protected environment. →The chance to let the imagination run wild in creating amazing places, situations and people. →The ability to rise above any difficulty with ‘words’. You don’t have to be good at writing to express yourself here. →The chance to interact with others collaboratively outside of sport. →The opportunity to learn about the best playwrights in the world and how they have shaped our language today. →The chance to develop their own ‘Voice’ and confidence in oral communication. 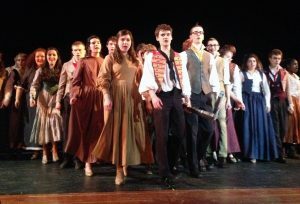 I was also taken to the theatre frequently by my schools – nowadays there are often too many costs or health and safety issues to make this a viable option. So how are we going to help children appreciate our rich playwriting tradition if they don’t experience it by doing it or seeing it? I took my granddaughter to her first Shakespeare at the age of nearly 7. There was some story telling and explaining first but she loved it. There was visual beauty, magic (literally), spectacle, music and humour. You don’t need to understand all of the words to feel the atmosphere. Are we going to confine the subject of Drama to a privileged existence in the Private Schools’ sector? Are our future actors only going to come from Eton and Harrow? Diversity?…..don’t make me laugh! And remember, I have focussed on my particular love – music and dance are destined to go the same way. You may be thinking – well, does it really matter? Well, do you want a future where everyone in business is good at taking orders and ticking boxes but has little imagination or creativity and doesn’t know how to work collectively? I believe that the opportunity creative arts provide to produce well rounded and fulfilled individuals cannot be overlooked. I hope I have made you think about this. We owe it to future generations to give them not just a full education at school but a chance to find out what makes them tick as individuals.